Winter brings all types of critters who can’t resist using a warm, cozy home as a respite from the cold outdoors. If you see one mouse in the house, it’s likely more are lingering in the cracks and crevices. Here are some tips for dealing with a rodent problem in and around your home. If you have any questions, stop by your local Ace to chat with an associate to find the best solution for your home. 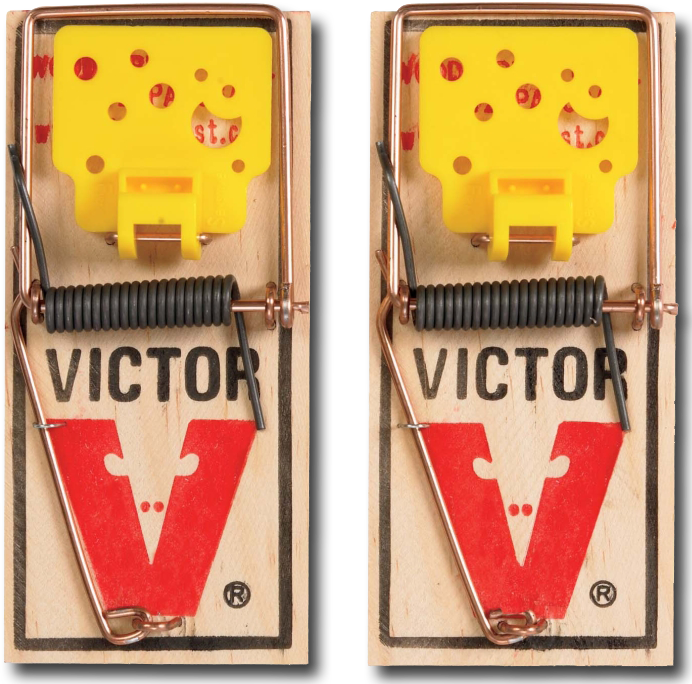 The Snap Trap: The spring loaded mousetrap has hardly changed since it was first invented in 1874. Over a century later, they are still used as one of the most affordable and effective methods to kill a rodent. If you prefer not to see the mouse, catch and contain snap traps are available. Our Ace expert says, “Wear disposable gloves when setting snap traps to prevent coating the trap with any oils & scents naturally found on your skin. If you don’t catch anything in the first 48 hours, try moving the trap to a new location.” Price Range: $1-$6 per trap. Glue Boards: The adhesive coating found on the top of these traps stops live rodents and insects in their tracks. Most use a scented adhesive, but we recommend placing bait in the middle of the trap such as dog food, peanut butter, or dried goods. The downside to using these traps is they don’t kill the animal, so this is not the best trap for anyone who is squeamish or uncomfortable handling the mouse. Price Range: $1-5 per trap. Baits & Poisons: If the problem is more than a few mice, poison may be the solution. Since it is lethal when consumed, pet owners and parents of small children should use extreme caution when using bait inside the house. We recommend a bait station, which contains the poison in a tamper proof container. Our Ace experts say, “Mix a little peanut butter with your bait to make it more attractive to mice and rats.” Price Range: $4-$12 for single use stations to multipacks. Problems with Rodents Outdoors: As unpleasant as they are in a trash can or yard, the outdoors are their homes, not ours. Still, that doesn’t mean you can’t take a stand and kick them out of your yard! If you want to eliminate a group of mice or rats, you can use an outdoor bait station (but make sure to keep pets and children from tampering with it) or a large spring loaded rat trap. Products like Shake Away Rodent Deterrent should be used around the perimeter of your home to deter nesting behaviors. Steel Wool Is Your Friend! You can buy all the traps in the world, but the problem really starts with the weak points in your walls, floors, and ceilings. If you can find the source of the problem (like cracks in the mortar or spaces between the molding), we recommend you plug any gaps or cracks with some steel wool or gap sealer. Ask an associate in stores for the best strategies for keeping those rodents out for good!